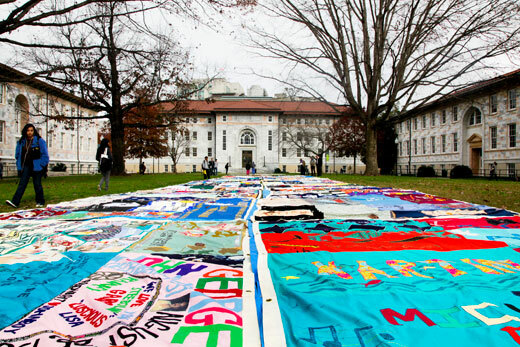 Emory will host its ninth annual Quilt on the Quad display Dec. 2. Updated Dec. 2: New location due to rain. The event has been moved to the Winship Ballroom, located on the third floor of the Dobbs University Center, 605 Asbury Circle, and will take place from 10:30 a.m. to 4 p.m. 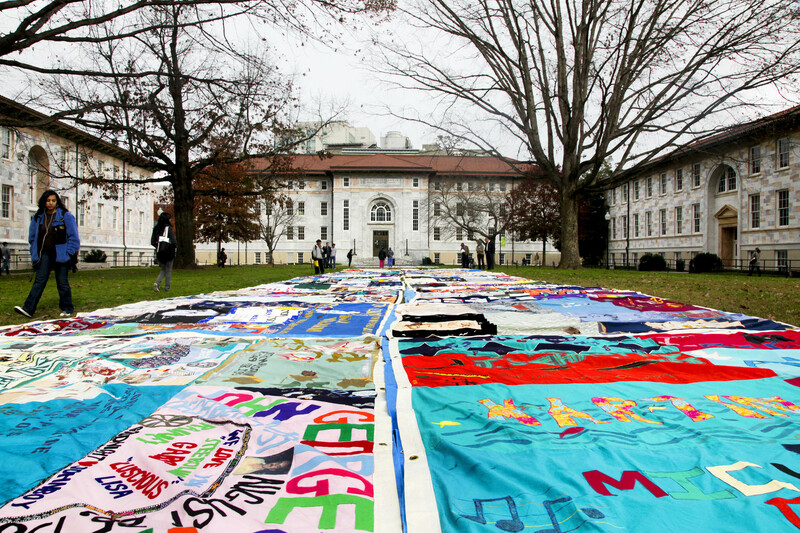 In honor of World AIDS Day, Emory University will once again hold "Quilt on the Quad," a display of panels from the AIDS Memorial Quilt, each telling the story of lives cut short by HIV/AIDS. Now in its ninth year, Quilt on the Quad commemorates World AIDS Day on campus, focusing on solidarity and awareness, and encourages progress in HIV/AIDS prevention, treatment and care. This year, panels will be displayed in the shape of a ribbon. The event, sponsored by Emory Hillel in conjunction with the NAMES Project Foundation, will feature a brief unfolding ceremony of the quilt panels, a reading of the names of each individual memorialized in the display, and performances by Emory a cappella groups. James Curran, dean of Emory's Rollins School of Public Health and co-director and principal investigator of the Emory Center for AIDS Research, will deliver the keynote speech for the event. In 1981, Curran coordinated the task force on acquired immune deficiency syndrome (AIDS) at the Centers for Disease Control and Prevention (CDC) and led the HIV/AIDS Division. "We put together Quilt on the Quad in honor and remembrance of those who have lost their loved ones to AIDS," says Emory College senior Carlie Marks, who has co-led the effort to bring the display to campus with junior Cydney Eisenberg. "We also do this to spread awareness and information to college students who are at an age where they are vulnerable to contract HIV. We want students to know how prevalent this is today within our age group." Emory physicians, scientists and educators have played a key role in HIV/AIDS discovery and treatment from the earliest days of the epidemic. Emory researchers invented HIV/AIDS drugs currently used by more than 94 percent of U.S. patients and thousands more globally. They developed and continue to test promising vaccines. Emory physicians treat and counsel thousands of HIV/AIDS patients each year, and teach and train new physician and research leaders. The Emory Center for AIDS Research provides support for 245 Emory and affiliated faculty, research fellows and post-doctoral fellows who conduct research throughout Emory University, the United States and globally. The NAMES Project Foundation, Inc., is the international curator of The AIDS Memorial Quilt, now headquartered in Atlanta. The foundation was established in 1987 as a non-governmental organization with the mission of preserving, caring for and using The AIDS Memorial Quilt to inspire action, heighten awareness and foster healing in the age of AIDS.